#IndigenousDads hit back at infamous Bill Leak cartoon. #IndigenousDads counter Bill Leak cartoon with stories of fatherhood. Indigenous fathers and their families have countered an “offensive and racist” cartoon by Bill Leak published in The Australian newspaper, using social media to share photos and memories of their family life. The cartoon, published on Thursday, portrays an apparently drunk Aboriginal man holding a beer can and not remembering his son’s name, as an Indigenous police officer grabs the boy by his collar. In its wake, Indigenous fathers and their families shared their experiences of fatherhood on Twitter under the #IndigenousDads hashtag. Users challenged the stereotype shown in Leak’s cartoon with photos and memories of love and dedication, and pride in Aboriginal culture. Indigenous Affairs Minister Nigel Scullion, The Greens, NSW Aboriginal Land Council, and the Victorian Aboriginal Child Care Agency chief all criticised Leak’s cartoon. “This type of cartoon helps no-one,” NSW Aboriginal Land Council chairman Roy Ah-See said. “In actual fact, it stokes the fire of racism and it plays into the stereotypical views of a lot of non-Aboriginal people out there think [that] Aboriginal people don’t have a place in this society. 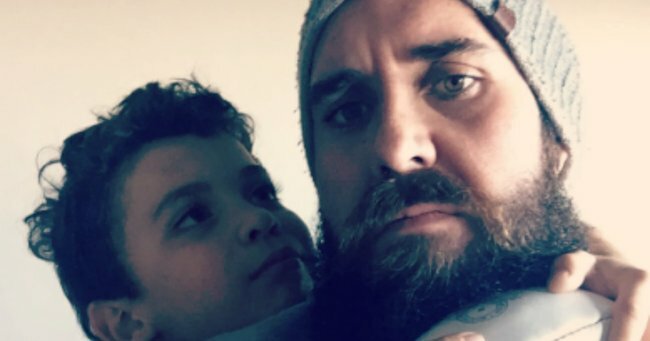 Ryan Griffen, the creator of the ABC TV’s Cleverman, an Indigenous Australian superhero television series, posted a photo of himself and his son. “No [sic] only do I know my son’s name but I named a superhero after him. #IndigenousDads #Cleverman,” he tweeted. In May, Griffen wrote a column for the Guardiantitled: “We need more Aboriginal superheroes, so I created Cleverman for my son”. “I wanted to create an Aboriginal superhero that he could connect with, no matter what others said,” he wrote. Leak hit back on Friday after further widespread condemnation on social media, describing his critics as “sanctimonious Tweety Birds having a tantrum”. He drew a second version of the cartoon, showing himself being handed by a black policeman to a man wearing a Twitter T-shirt and carrying a club and a noose. The Australian’s editor-in-chief Paul Whittaker also defended the paper’s decision to publish the “confronting” cartoon. “The Australian is proud of its long-standing and detailed contribution to our national debate over the crucial issues in Indigenous affairs,” Whittaker said in a statement.